McFall Crags is a dominant skyline feature located southeast of Rattlesnake Peak, in the Santa Catalina Mountains north of Sabino Canyon but south of the West Fork Trail. It’s craggy summit suggests it was well named, but I could find nothing about its original naming. At 5840 feet above sea level, there are a dozen or more peaks in the Pusch Ridge Wilderness that are higher. Heck, even Romero Pass at 6080 feet is higher. However, its isolation from any semblance of a normal trail and protection by various geographic features which limit access from any direction, make this one difficult hike. It is important to remember that McFall Crags, as a destination, is wonderful. There are beautiful, expansive views in every direction: Radio Ridge on Mt. Lemmon, Cathedral Peak, Rattlesnake Peak, Thimble Peak, and Rattlesnake, Box Camp and Pine Canyons, and West Fork Sabino Canyon, just to name a few. Rather than suggest one way of reaching this fabulous summit, I have mentioned several possible approaches, some of which have been used by previous hikers and one that has potential but, as far as I know, has not been tested. I have pulled information from previous triplogs and tracks on HAZ, and at least one internet source in describing these alternatives. I will be interested in seeing what readers post about other ways to access this outstanding summit. 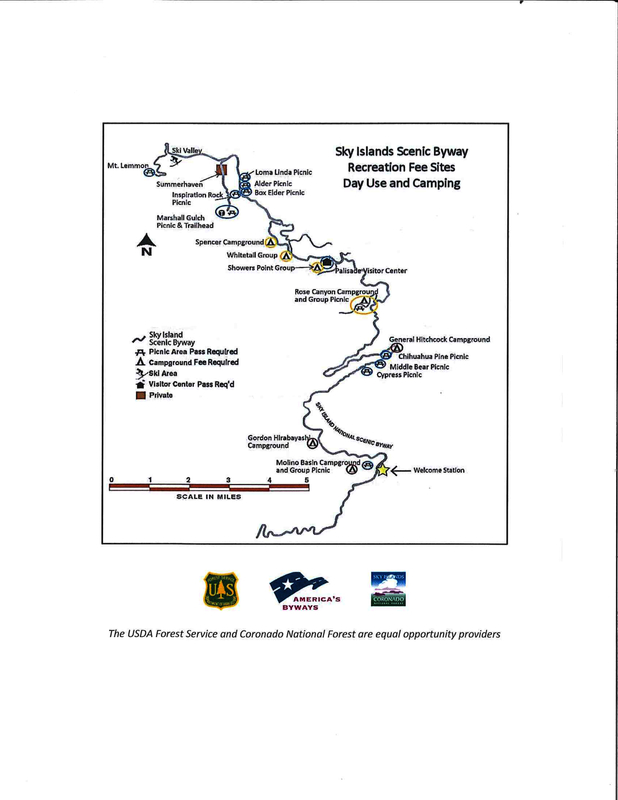 The “official” track for this hike, posted by another HAZ member on December 29, 2012. 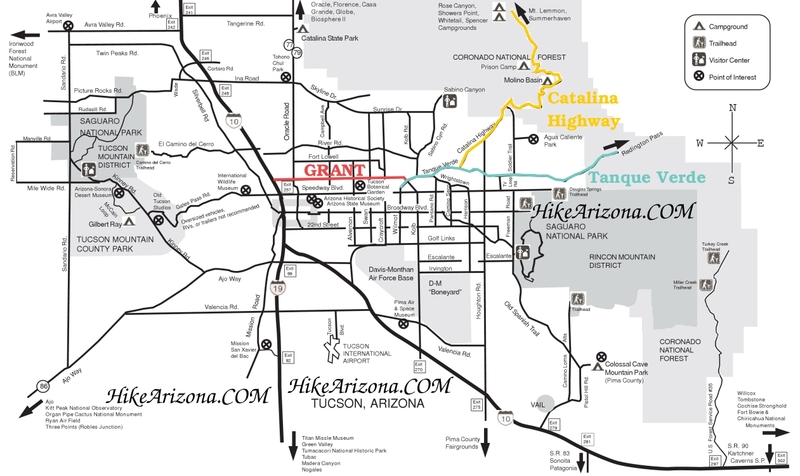 If you follow this route, start at Sabino Canyon Visitor Center (SCVC), hike up the road a little over a mile and turn left (west) onto Rattlesnake Trail #50. Go about 1/3 mile and turn right (northeast) into Rattlesnake Canyon and go nearly to the saddle between Rattlesnake Peak and McFall Crags. About a mile before reaching the saddle, start looking for a possible scramble route to a point just northwest of the crags. Be forewarned that there are some significant pour-offs to negotiate along the upper part of the part of the canyon. Climb to and scramble across the ridge to the base of the crags. The track suggests they found a way to summit from the northwest. The return was by the same route, except for a minor variation at the point where they reentered the canyon, probably to avoid a pour-off. This alternative is not easy by any stretch since Rattlesnake Canyon, up and back, is a continuous boulder hop and scramble after the first half mile. The boulders are hard to negotiate and footing is complicated by the tall grasses. Basically, there is no easy hiking in the upper part of the canyon. This alternative is the author’s first summit of the crag on March 6, 2015, which started and ended at Sabino Canyon tram stop #9 (the uppermost one). Cross Sabino Creek to the west and take the steep canyon northwest to the obvious saddle. Once at the saddle, turn west and hike another 1/3 mile to the base of the crag. Our climb to the top was along an opening from the northeast. You will soon reach a place to leave your pack and other gear. Progress is slow because of the dense vegetation. At one point, you go through a short tunnel in the rock. Continue the short class 3 scramble to the top. Return the same way to stop #9. The shorter distance and lower aeg suggests this alternative is easier than # 1, but the descent down the steep wash is complicated by the presence of tall grass that makes each step an adventure. Despite the stats on this alternative, it is a full day even for experienced hikers. This is the author’s most recent summit of the crag in January 2018, and is a hybrid of #1 and #2. It starts at tram stop #9, goes up the facing canyon to the northwest, along the ridge to the base of the crags. Most of us followed the same scramble route up to the summit, but one person found another access from the north side. He described it as a walkup, but expect some class 3 scrambling. At any rate, he was at the top waiting on the rest of us. We had intended to take a different way back, basically straight south about ½ mile, down the ridege through a slot we hoped to exist, then down the relatively mild (based on a an earlier aborted attempt, look at my February 9, 2015 track when we started at tram stop #8) ridge between Rattlesnake and Breakfast Canyons back to the SCVC. However, we looked longingly down bucolic and beautiful Rattlesnake Canyon, which seemed to be beckoning us to take it instead of the ridge. It looked benign and easy, so we took it. Unfortunately, we ran into several pour-offs (one over 100 feet), where we had to pick our way through some class 4 stuff to get to the canyon. Once we got to the canyon, it was no picnic either because of the huge, slick boulders and grass that hid landings. Progress was slow and arduous. While researching this description, an excellent record of a traverse/loop route was discovered in an independent blog which included both McFall Crags and Rattlesnake Peak. That route started at SCVC, climbed up the easy ridge between Rattlesnake and Breakfast (basically our way down on 2/9/15), detoured along the contour over to where our March 6, 2015 track reached the saddle, then west to the crags. What is different about this alternative is that the hikers continued northwest, climbed Rattlesnake, down-climbed to the West Fork Trail above Hutch’s Pool and came back down Sabino Road to the SCVC. These are two important aspects to the blog; it shows that the route in/out to the south is possible (and this has been confirmed by one other long time Tucson hiker) and that there are routes out to the north that may be easier than the ones up Rattlesnake Canyon and from tram stops #8 or #9. Stay tuned for future HAZ triplogs for the latest information. So, the jury is still out on the best way to get to McFall Crags. Whichever route you chose, expect a long day and some pain. The destination, however, is worth a little pain.